As soon as the first few note trilled we 90's kids knew exactly which of our favorite Disney songs we were about to hear, in fact, we were ready to sing along with all the words. The village scene song in Beauty and the Beast was no different. When we watched the movie as we'd brace ourselves we'd wait for Belle to come out of the small French chateau with its windmill and little waterfall, then the flutes and violins would start. Depending on what kind of kid you were you either sat enraptured, or sang along with every single word. Maybe you even kept up with the Bonjours! We couldn't have asked for a more wonderful trip down memory lane when the long awaited live action Beauty and the Beast came out. With all the classic one-liners and songs, the movie gave us the rush of nostalgia we were hoping for. It was especially exciting to see the live action version of Belle's clothes. Her village dress is at once more colorful and homespun than the original, so in line with our unique heroine. It's so charming, we wouldn't blame you if you sneak it into your everyday wardrobe. 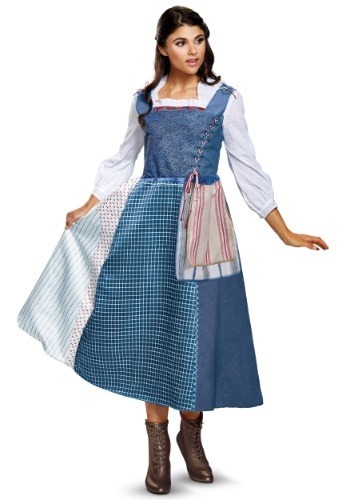 You might have dressed as Belle as a kid and want to relive the glory. Or maybe you missed your chance when you were little and are living the dream as an adult. Either way, you'll love acting out your favorite scenes. Once you put on this dress you'll want to run to the hills and twirl. Or maybe you'll want to angrily throw your chickens some feed as you rant about the boorish, brainless Gaston (whatever's easiest!). When you put on your dress you'll be ready for adventure in the great wide somewhere.